The monetary jurisdiction is a maximum of $6,000 for a small claim filing and $15,000 for a civil filing. To file a small claims or civil case in the Perrysburg Municipal Court, the action must have occurred or the defendant must reside within the geographic jurisdiction of this court. Anyone filing a trusteeship must reside within the geographic jurisdiction. The jurisdiction of the Perrysburg Municipal Court covers the geographic area of the cities of Perrysburg, Rossford, and Northwood; the townships of Perrysburg, Lake, and Troy; and the villages of Luckey, Millbury, and Walbridge. Mediation is a process in which a third party promotes and facilitates communication between the parties to help them resolve their differences. Most disputes which reach the court could have been settled more quickly and easily through better communication. Mediation provides for informal communication in a relaxed atmosphere. The mediation procedure is generally voluntary, but because this court's mediation program operates on a post-filing basis, it is necessary for all parties involved to consent to mediation. Post-filing simply means that all mediation cases originate from the filing of a small claim or civil complaint. The only fee charged is the filing fee at the time of filing the complaint. There is no additional fee for mediation. If the dispute is not settled in this manner, the claimant has lost nothing, and the case is referred back to the court for hearing or trial. If the case does settle at mediation, the inconvenience of a full-scale trial for claimant, respondent, and their respective witnesses is avoided. In addition, both sides win with neither side risking the loss of having the judge decide against them, saving the expense of attorney fees, and the time, effort, and money that could be spent gathering evidence. Privacy Matter of public record Sessions are private and confidential. Any entries signed by the judge may become part of public record. Limitations For money only (i.e. the small claims limit is $6,000 Limited only by the parties' imaginations and decisions to agree to proposals. Download "A Citizens Guide to Small Claims Court"
Download "How to Prepare and File Your Claim"
Plaintiff: The person filing the claim is known as the "plaintiff'. As the plaintiff, you may claim money that is due to you only. You may not file a claim for someone else's money. Enter your legal name and your full address including zip code in the upper left hand corner on the lines designated. Defendant: The party you seek money from is known as the "defendant". In the upper right hand corner of the form on the lines designated, enter the name, address, and phone number (if known) of the defendant. If there is more than one defendant, enter the names, addresses, and phone numbers of each of the defendants. If you are filing against a corporation, enter the name of the corporation and the address of its usual place of business. All cases must be properly venued; that is, properly within the court's geographic jurisdiction. Generally, venue is proper in the cities of Perrysburg, Rossford, and Northwood; the townships of Perrysburg, Lake, and Troy; and the villages of Luckey, Millbury, and Walbridge if either the incident or transaction giving rise to the claim occurred in the locations mentioned, or if the defendant resides or conducts business in the locations mentioned. The Amount of Your Claim: You may ask for money only. No other recovery is permitted in the Small Claims Division. You may not recover "punitive damages", nor lost wages, traveling expenses, costs of obtaining evidence, baby-sitting and the like, incidental to your court action. You may recover court costs and interest from the defendant if you win your case. The Nature of Your Claim: In a brief statement, explain why the defendant is indebted to you. include in your explanation where, when, and how the debt arose. It is not necessary to explain your past efforts to collect this money. On (date of accident), at (street location) in (City), Ohio, defendant negligently operated a motor vehicle into plaintiff's (make, model) automobile, proximately causing $_____ in damage. Defendant owes plaintiff $ ______ for money lent to defendant on (date of loan). Defendant owes plaintiff $______ for wages earned between (date) and (date). On (date), plaintiff and defendant entered into an agreement for the rental of the premises commonly known as (address of rental property). Plaintiff paid defendant $_____ as security deposit, to be refunded to plaintiff at the termination of the rental agreement. On (date), the rental agreement was terminated and plaintiff gave to the defendant plaintiff's forwarding address in writing. Defendant has failed to refund plaintiff's security deposit. Defendant owes plaintiff $_______ on an account, a copy of which is attached hereto as Exhibit 'A' (you will need to supply three copies of the account as exhibits). The examples above demonstrate a concise, non-technical way of stating the facts so anyone reading your complaint may understand the nature of your claim. If the examples do not apply to your case, simply state the facts in your own words. 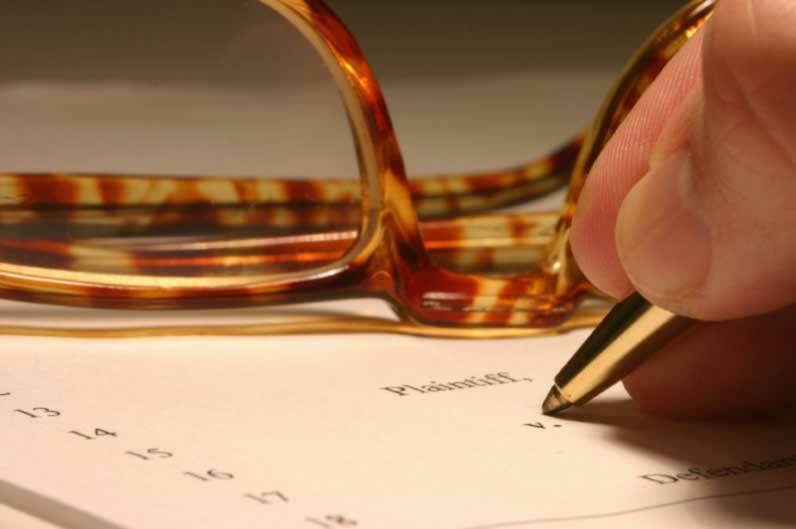 Signing the Form: You must sign the form in the presence of the Deputy Clerk of the Court or a Notary Public. Below your signature, please provide a phone number where you may be reached during the day. Filing Procedure: Return the form to the Civil Division office. The clerk will schedule your case for trial. You must pay a $45.00 filing fee with the Clerk at this time. Legal Advice and Assistance: Representation by an attorney at law is permitted, but it is not required. If you need legal advice, you should contact your attorney. Corporations and Limited Liability Companies: Corporations and limited liability companies may only file a complaint in small claims or appear in court to defend a small claims complaint through an attorney at law, a bona fide officer, or a salaried employee. Without an attorney, a corporation or a limited liability company may only present their own testimony and they may not engage in any acts of advocacy, including argument and cross-examination. A judgment gives you a legal right to collect the amount awarded by the court. The best and simplest way to collect your judgment is to contact the other party and arrange a voluntary payment, either in a lump sum or in installments. If the other party refuses to pay the judgment amount voluntarily, you may use the available legal collection methods. However, you must provide the court with the information listed with each collection method. Be sure to have your case number. Wage garnishment: Exact name and address of the other party's employer. Bank garnishment: Exact name and address of the other party's bank. Attaching money in cash register: Exact name and address of the other party's business and location of cash register at the business. Attaching personal property: Exact location and description of property (serial number, make and model, etc.). Be advised that this method involves the following costs: three appraisals, the costs related to the actual sale of the property, and a bond in an amount determined by the court. Liens: Exact location of real estate. Record certificate of judgment at the County Recorder's office, County Courthouse. License Revocation: Name and address of defendant, birth date, social security number, date of accident, operator's license number, and small claims case number. All inquiries must be accompanied with your civil small claims case number. Find out where the debtor has bank accounts. Bring the filing fee to the Small Claims Division. Have your case number handy. Fill out the necessary forms with the Small Claims Clerk. The bank has up to two weeks to respond, after which time, you can check on the bank's response by calling the Small Claims Division and giving your case number to the Small Claims Clerk. Pick up a 15 day notice form from the Small Claims Division and mail this form certified mail to the debtor. Save your certified mail receipt and an extra copy of 15 day notice. After 15 days have passed, bring to the Small Claims Division the green certified mail card that is returned to you (signed or unsigned), receipt to show proof of mailing, and copy of the 15 day notice you sent. Have your case number handy. The 15 day notice is valid for 45 days from the date of mailing. However, you cannot begin garnishment proceedings until the first 15 days have passed. This means that the 15 day notice is good for proof of mailing purposes for a period of 30 days. Once you have filled out the wage garnishment forms completely with the name and address of the debtor's employer and after paying the filing fee, the garnishment forms will be served on the debtor's employer. The employer has up two weeks to respond, after which time you may check on the employer's response by calling the Small Claims Division. Have your case number handy. Must have a current garnishment or notice of pending garnishment. All debt must be in the name of the person filing. Must be employed or live within our jurisdiction. Download "Application for the Appointment of a Trustee"
Download "Statement as to Creditors"
All original bills of debt must be provided with current balance owed, account number, and payment address for creditor. Interest must be paid outside the trusteeship on any interest bearing accounts. Only bills over $25.00 are accepted. No current utility bills will be accepted. Only closed utility accounts with a past due balance will be accepted. Car payments are accepted, but the car can still be repossessed. Debt incurred before the trusteeship may be added after the initial filing for an additional $7.00 only upon approval by the Judge/Magistrate. Always be sure that you have your trusteeship number when making payments or calling the office regarding your account. PAYMENT WILL NOT BE ACCEPTED WITHOUT YOUR PAY STUB. When a payment is made at the counter, present your pay stub so that the minimum payment of 25% may be verified. When mailing payment, enclose your pay stub along with your check or money order and trusteeship number. If you wish to have your pay stub returned, enclose a self-addressed, stamped envelope. The amount to be paid into the trusteeship account is figured by adding everything EXCEPT TAXES back into your net (take home) pay; i.e., uniforms, union dues, insurance, child support, etc. On this amount we take the 25% for your trusteeship payment. Whenever you are off work for ANY reason, inform the Trustee Clerk IMMEDIATELY. You must report every two weeks should you be off work for an extended period of time. However, if unemployed indefinitely, your trusteeship must be terminated, as employment is a prerequisite for trusteeship and there must be a regular deposit of monies into your account. If you change your job or address, you must advise the court IMMEDIATELY. Your account will be terminated if no payment is received for 30 days. Re-filing cannot be made before a six month period has lapsed. You MUST pay on each pay check you draw. NO EXCEPTIONS ALLOWED even though it may be only for one days work. This applies also to vacation pay and unemployment checks. Payment must be received within three (3) days of receiving your pay check. Only with the Judge's approval will bills be accepted after 30 days from filing the trusteeship. A fee of $7.00 will be charged each time you add new accounts.